The Stelvio Ti is an accomplished performer through the corners. SPORT utility vehicles, or SUVs, rarely live up to the "sport" promise in their name. As a rule, they're too bulky and top-heavy to be genuinely fun to drive. The Alfa Romeo Stelvio Ti is different. 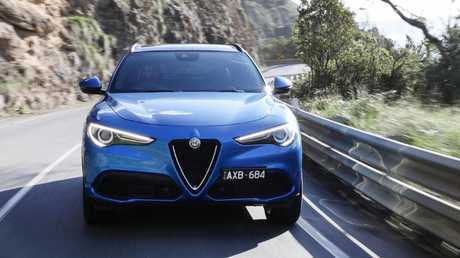 The car named after one of the world's best known winding mountain passes, the Stelvio is not "pin-your-ears back" quick off the mark, but it delivers ample driving thrills through the bends. Compared with its high-performance German rivals in the mid-size luxury market, it is down on power and torque but makes up for that with a starting price that's between roughly $20,000 and $30,000 lower. 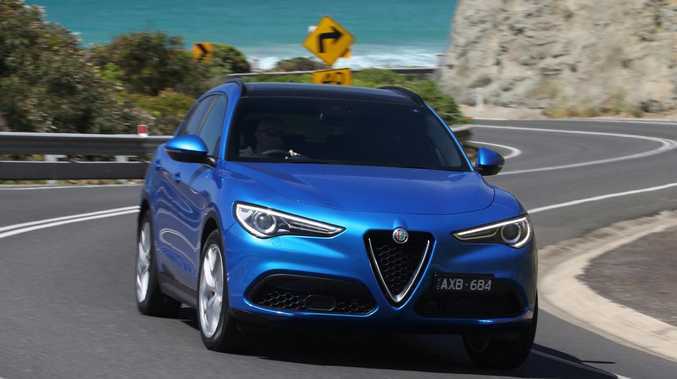 The Ti model (for Turismo Internazionale) costs $83,900 on the road, a $14,000 premium over the standard Stelvio. The Stelvio Ti has more power than the standard model. Picture: Supplied. For that premium, there's a substantial bump in power and torque of almost 60kW and 70Nm over the standard four-cylinder turbo. That shaves the 0-100km/h time from 7.2 to a hot-hatch beating 5.7 seconds. But the extra power isn't the impressive thing about the Stelvio Ti. Anyone can - and lots do - build SUVs with obscene power outputs and blistering 0-100km/h times, but not many are adept at handling hairpins and switchbacks. To help with the delivery of extra power to the wheels, Alfa adds a limited slip rear differential, special KONI dampers and bigger 20-inch wheels wrapped in sticky, low profile Michelin rubber. The Stelvio Ti has red brake callipers and bigger wheels. Picture: Supplied. 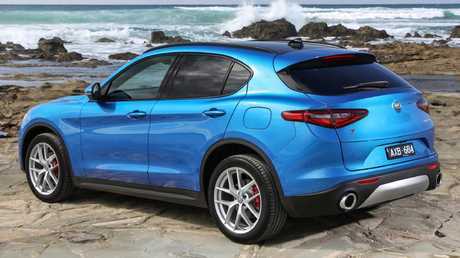 Then, because it's Italian, there are special styling cues, from red brake callipers outside to heavily bolstered sports seats, a racy flat-bottomed steering wheel and aluminium sports pedals inside. There's also an upgraded 10-speaker audio system, heated front seats and steering wheel and privacy glass for the second row. The standard Stelvio has a comprehensive safety package including standard auto emergency braking at freeway speeds, lane departure/blind spot warning and rear cross traffic alert but the Ti adds active cruise control. It's a pretty compelling argument to step up to the Ti from the base model if you can afford it. The Ti can be optioned with adaptive suspension. Picture: Supplied. If the budget stretches further you can option a panoramic sunroof for $2400, active suspension for $2200 and an excellent 14-speaker Harman Kardon audio system for $1500. Solid red and white paint is free, but metallic colours such as racing green and Monte Carlo blue (pictured) are $1690 extra. For the really dedicated followers of fashion, tri-coat Competizione Red or Trofeo White is a whopping $4550. Standard fare in the cabin includes Apple Car Play and Android Auto (with voice to text and text to voice messaging), keyless entry, digital radio, powered tailgate and dual-zone airconditioning. The cabin lacks a little flair for a sporty model. Picture: Supplied. Our test car's cabin looked smart but was lacking a little of the wow factor in a similarly sized Benz or Audi. The black on black interior colour scheme can be changed to red and black or chocolate brown and black for more adventurous buyers. 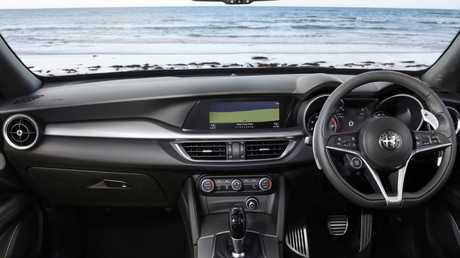 The centre screen is small and the rear view camera isn't the sharpest, especially at night, while the dash material is soft touch but lacking the visual appeal of some rivals. Rear accommodation is a little tight, but the boot is a good size. Alfa has put a lot of effort into making the Stelvio fun to drive. 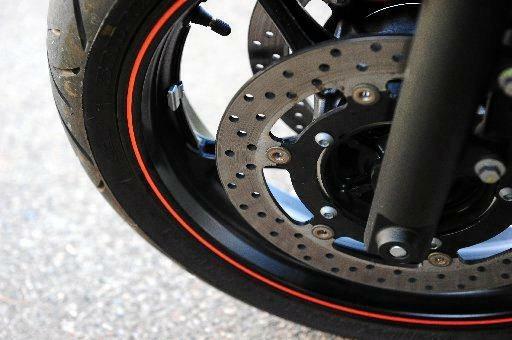 Its all-wheel-drive system acts like a rear-wheel-drive system until it detects slip. The rear-drive bias, combined with the limited slip rear differential, makes it feel sharper when turning in and driving out of corners. 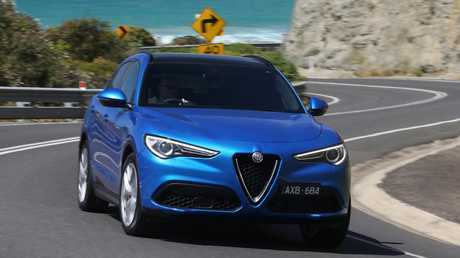 The Stelvio is an entertaining drive, thanks to its light weight and sharp reflexes. Picture: Supplied. Close to 50-50 weight distribution front to rear delivers impressive balance when changing direction, while our car's optional active suspension delivered an excellent compromise between comfort and a flat stance through corners. There's minimal body roll through corners and little of the typical pitching under heavy braking you find in most SUVs. The sporting feel is accentuated when the selectable DNA drive mode is dialled up to sports mode. The steering is sharper and the gear shifts and throttle response are more aggressive. Steering column mounted paddle-shifters allow you to control shifts, but the auto does a good job of finding the optimal gear on its own. The only disappointment on our test car was a less than reassuring brake pedal feel. It may have had a hard life. 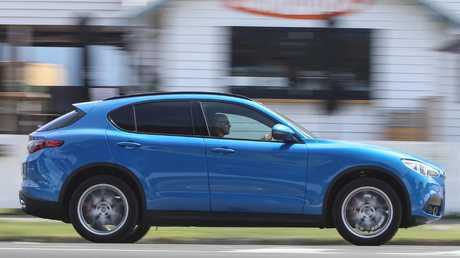 The Stelvio is one of the rare SUVs that delivers on the promise of a sport utility vehicle.